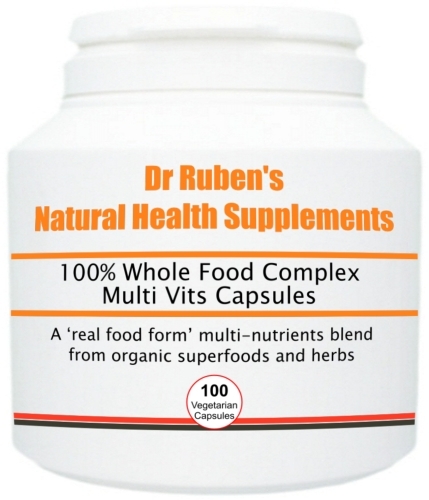 14 organic superfoods in a single multi-nutrient capsule! 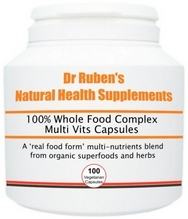 MAXvits SuperFoods is a 100% organic 'food state' herbal multivitamin, which contains an incredible 14 superfoods. The high nutrient content from these whole food ingredients supports natural detoxification, energy production and internal organ cleansing. The unique combination of ingredients found in our organic MAXvits SuperFoods is an all-natural, wide-ranging blend of vitamins, minerals, amino acids, oils and trace elements. Alfalfa: Also known as purple medick, lucerne, California clover or Buffalo herb and Medicago sativa in Latin, alfalfa is native to Asia, but is now found in temperate regions. This sprout contains alkaloids, isoflavones, coumarins and sterols. It also contains 8 essential enzymes: - amylase (digests starches), coagulase (coagulates milk), invertase (converts sugar into dextrose), emulsin (acts upon sugars), peroxidase (oxidases blood), lipase (fat-splitting enzyme), pectinase (forms a vegetable jelly from pectin) and protase (digests protein). Together with its rich content of enzymes, alfalfa offers a broad spectrum of vitamins and minerals including pro-vitamin A (B-carotene), B6, C, D, E, K and P. Alfalfa yields 10 times more mineral value than average grains. The root penetrate sub-soil as far as 125 feet, thereby enabling it to absorb vital mineral nutrients beyond the reach of other vegetation (including calcium, magnesium, phosphorous and potassium). Baobab fruit: Known as the "tree of life", this fruit of the baobab tree has 3 times as much vitamin C as an orange, 50% more calcium than spinach and is a plentiful source of antioxidants. Barley grass: Barley (Hordeum distichon in Latin) is considered to be a near-perfect food. It is high in fibre, calcium, iron, magnesium, potassium and lysine (an essential amino acid). Young barley contains concentrated levels of vitamins, mineral nutrients, amino acids, enzymes and chlorophyll. It is 7 times richer in vitamin than oranges, 5 times richer in iron than spinach and has 25 times the potassium found in wheat. Beetroot: Known as Beta vulgaris in Latin, beetroot has a high iron content and is rich in silicic acids, dietary nitrate, selenium, betaine, vitamins A, C and E, flavonoids, antioxidants and fibre. Bilberry: Also known as a huckleberry and European blueberry (and Vaccinum myrtillus in Latin), bilberry is a herb that is rich in vitamins (including vitamins A, C and P), bioflavonoids, antioxidant compounds called anthocyanosides and resveratrol, and minerals (such as manganese). Carrot root: Technically referred to as Daucus carota, carrots are an under-estimated source of essential nutrients. These root vegetables are rich in beneficial compounds such as carotenes, vitamin A, B-vitamins, vitamin C, minerals (like copper, calcium, potassium, manganese and phosphorus) and antioxidants. Dandelion root: Referred to as Taraxacum officinais, dandelion contains active carotenoids, sesquiterpene lactones, vitamins A, B and C and is rich in nutrient minerals. Green tea leaf: Camellia thea, or green tea is a rich source of potent polyphenols - active compounds that may have beneficial health properties. Some studies have shown green tea polyphenols to have a stronger antioxidant action than vitamins C and E - two of the most powerful antioxidants. Kelp: A natural food that is very low in cholesterol and is a good source of dietary fibre, riboflavin, vitamin C, vitamin K, pantothenic acid, zinc, copper, folate, calcium, iron, magnesium and manganese. Lemon peel: Lemon, or Citrus limonum, contains flavonoids, coumarins, mucilage, vitamin C and citric acid. Lemon peel, in particular, is very low in saturated fat, cholesterol and sodium, and is an excellent source of vitamin B6, dietary fibre and calcium. Spinach leaf: Spinacia oleracea has a high nutritional value and is extremely rich in antioxidants, vitamins A, B2, B6, B9 C, E, and K, lutein, magnesium, manganese, folate, betaine, iron, calcium, potassium, folic acid, copper, protein, phosphorus, zinc, niacin, selenium and Omega 3 oils. More recently, opioid peptides called rubiscolins have also been found in spinach. Spirulina: A highly nutritious food derived from plant plankton; a blue-green micro-algae, spirulina contains no less than 18 amino acids, including 8 essential amino acids which the body cannot produce from its own resources and have to be replaced daily by food. Rich in beta-carotene, vitamin E, vitamin F factor (GLA) and iron, it grows naturally on alkaline lakes for its high level protein, vitamins and mineral. 100g of spirulina yields 50-70% protein. Its exceptional levels of vitamin B12 is of special interest to vegetarians, vegans and non-meat eaters who, unless they study their diets carefully, may be deficient in this important vitamin. Turmeric root: Curcuma longa is a spice which contains volatile oil, a wide range of vitamins and minerals and the yellow pigment, curcumin. Wheatgrass: The crop from germinated seed of wheat grains, wheatgrass is rich in chlorophyll, plant protein, enzymes and a broad spectrum of vitamins (including vitamins A, C, K, E and all the B vitamins) and trace minerals (including iron, phosphate, boron, copper, selenium, sodium, calcium, magnesium, potassium, chromium, manganese and zinc). It is also an important source of superoxide dismutase (SOD), an enzyme which may play an important role in detoxification of the body.